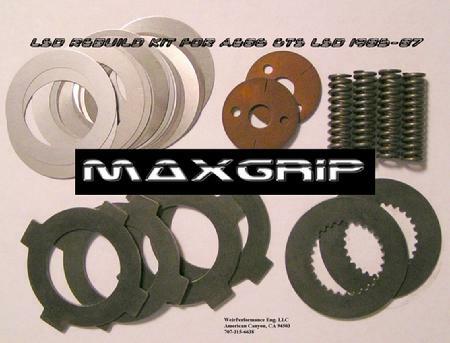 We are pleased to offer our MAXGRIP LSD rebuild kits. These kits are designed to increase the performance of your O.E.M. LSD unit. With our kits installed correctly your LSD will perform better than if it was new. We are also offering MAXGRIP LSD kits for some aftermarket LSD units, all designed to improve performance. Our kits offer performance increases you can actually feel, not just impressive sounding numbers. Toyota Corolla AE86 GTS- ALL $190.00 ea. Toyota Cressida IRS $190.00 ea. MAXGRIP Supra 7.5". A real performance rebuild kit for the O.E.M. Supra LSD. These parts have been designed to get the maximum grip possible with the o.e.m. LSD! The kit comes with new stationary plates and new clutch plates that were normally not installed from the factory. Adding these two clutch plates increases the overall friction surface area 4X or 200% more than the typical factory LSD. Also included are new reversible solid bronze thrust washers, spiral grooved for oil. You also get new heavy-duty springs and complete shim kit (16 assorted thicknesses) for setting the clearances within the LSD to exact specs for best performance. Using this kit, your LSD will be more responsive, lock faster, with maximum grip! No more one-tire fire! We are pleased to offer three kits for the O.E.M. MkIII Supra LSD. This LSD is known for its lack of performance, this is for the most part caused by sloppy assembly at the factory. We have opened up many of these units and have not seen one yet that was worn out. Unfortunately these LSD units do not have clutch members or pressure rings to apply clamping force to the clutch plates. In order for these LSD units to function properly for performance applications they need to be correctly shimmed and the spring pressure increased. Our first kit is designed to increase the spring pressure for street and track use. It will be far more aggressive than O.E.M. but not too aggressive for daily use. Our second kit is for competition use only, higher HP cars and for the off road guys who swap in Supra LSD units into their truck rears. Finally our third kit is full lock, designed for drag racing and drifting only, not be used on the street. We will post up our rebuild procedures for this LSD soon! Supra 1986.5-92 MAXGRIP KIT #1 (Street/track upgrade) $45.00 ea. Kit comes with a full set of 8 shims thickness� from .005�, .008�, .010�, .015�. Also comes with a heavy duty spring used in conjunction with the O.E.M. spring to increase the spring load from 550lbs. to 790lbs. Using this kit we have reached a breakaway torque of 100 ft.lbs. Supra 1986.5-92 MAXGRIP KIT #2 (competition/truck upgrade) $75.00 ea. 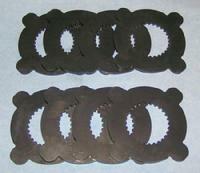 Kit comes with a full set of 8 shims thicknesses from .005�, .008�, .010�, .015�. Also comes with steel spacer ring and two disc springs. These parts replace the O.E.M. spring and increases spring load from 550lbs. to 1500lbs. using this kit we have reached a breakaway torque of 250 ft.lbs. This kit is not for the timid, serious competition use only. This is our full locking kit. It has all the benefits of a spool for drift and drag racing without the need for special tools or welding to install. It is by far the simplest of all our MAXGRIP kits. Kit comes with 8 lock plates, heat treated steel, will withstand high HP and hard launches. Can be installed in an afternoon, no measuring required. Not for use on street vehicles for racing only. Mitsubishi Lancer Evolution 4-9 $210.00 Ea. A real improvement over the stock LSD that requires NO modifications to your LSD to install. This kit comes with 12 new plates and uses your existing OEM spring plates. Install is very easy, requires no shimming and comes with detailed instructions.With our MAXGRIP kit your LSD will lock harder and firmer than you ever thought possible and still remain street friendly. The best part is you can install this kit on a Saturday in your garage and save the expense of shipping your diff and down time. This kit will increase the performance of your factory LSD to comparable performance of the very expensive aftermarket units. You will notice LSD chatter when using this kit, which can be reduced with friction modifiers if you choose to do so. Kit now comes with 2 new spring plates for a total of 14 pieces. AE86 Corolla GTS TRD MAXGRIP kit $180.00 ea. This kit fits Kouki or Zenki TRD LSD units for the corolla GTS. Our kit adds one more clutch per side gear over the factory 8 plate clutch set giving you a total of 12 plates. The LSD will lock harder, faster and firmer with this kit. If you are unsatisfied with your TRD LSD, this kit will make you smile. Comes with all new clutch plates, stationary plates and thrust washers. We also install all of the kits we sell at a very competitive price, right the first time. Save money and time and call us to find out how we can help you! Also, we work on many other LSD types as well and are always interested in helping people with rare LSD units that are not working as good as they should be.